John Skinner retired from a career in finance five years ago. It was probably a wise decision based on the time he's been logging - he's possibly working harder than ever before. No one ever said building a winery would be easy (just crazy), but constructing the physical winery might well have been the easiest task he's had dealt with in the decade since he began the process of building his family's legacy. I met with Skinner recently, just a day after he had returned from an impressive business trip to Tokyo where he was pouring his wines for sommeliers and buyers. Skinner was in love with southern France. He had spent a good amount of time there with his family and was an avid consumer of French wine, specifically Bordeaux wines. Initially he thought to purchase land and start making wine there - wisely he changed direction. It took him three years of searching to find the place - the perfect location to plant vines. "I knew that if I found a place that was nine out of 10 [on the perfection scale], my wines would only ever be 90%." Skinner was only willing to settle for a 10. The location he found is not only a perfect 10 for soil and exposition but it also knocks it out of the park for sheer beauty. Overlooking Skaha lake, outside of Penticton, BC, the site (once home to an apricot orchard) is unarguably home to one of the most beautiful vistas in the Okanagan Valley. Skinner is not someone who does things by half measure. Do it right the first time. "Hard decisions pay off", he says. After a lengthy search for the property, Skinner wrote a big check to cover the purchase of the land. Not surprisinly, he wasn't going to take no for an answer. The next step was preparing the site, contouring it (2004) and then planting the vineyard (2005). His love of Bordeaux wines led him to plant Cabernet, Merlot, Malbec, Petit Verdot and thanks to respected BC wine writer, John Schreiner, Syrah. In addition, he planted a single block of Chradonnay. Each decision made, each row and variety planted needed to be in the perfect place - suited to each. Today, Skinner says, they made all the right decisions. "There was no luxury of a missed step for us." His next smart move was hiring international consultant, Frenchman Alain Sutre, in 2006 to join him and vineyard manager Barry Green. Sutre specializes in vineyard and winery project management and the analysis of the entire wine production process. Sutre took the team at Painted Rock through the vineyard several years ago and block by block and vine by vine began to analyze it. The vines were given a number (one, two or three) assessed on their health and hardiness. The follow up was that each vine was pruned individually depending on it's score. Skinner tells me that the smallest and weakest vines are now, several years later, nearly on par with the strongest. A big undertaking that had paid off - in 2014 he believes the vines will all be status quo. As the vines have matured (the current 2011 vintage releases mark Painted Rock's fifth vintage) the focus has shifted, organically. "We now know we can get power out of the vineyard, now we're trying to get the elegance." In my opinion, 2011 is just that. The cooler vintage created some stress for Skinner - a slow start made him wonder... "What will the property be able to do in this challenging vintage." He admits he relaxes a bit each vintage now as he sees that many things are beyond his control and that the property seems to thrive on challenge. The 2011 vintage was held back longer prior to release than previous vintage. A true testament to the cooler vintage, the acidity is more pronounced and there is a very femininity and elegance to the wines. A combination of the vintage and some vine maturity make the 2011 vintage reds my favourites, so far. Skinner continues to win awards and draw attention from markets around the world. He feels the national accolades and high scores from well-known Canadian media have helped him get his foot in the door of the Asian market. 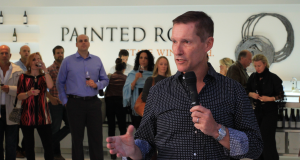 He's sold Painted Rock wines in China but is currently throwing more focus upon Japan with a goal of selling in London and New York as well. He is not resting on his laurels. He believes by pushing his wines and the other top wines of British Columbia out in front of international clients, they will not only gain international attention but garner more respect from Canadian wine drinkers. If successful, he'll not only leave a legacy for his son and daughter but pave the way for his friends and peers in the BC wine industry. I've no doubt he'll be victorious. While demand may increase, Skinner vows to maintain the cap at 5000 cases... Exactly what the winery is currently producing.